The Chickens Are Coming to Churchville Oh My! I wanted to let you know that yes you can indeed have chickens in your back yard. I looked into and asked the mayor he said whatever Krissy wants I want. I love Earl but really he drives me crazy sometimes. Anyway we have no city ordinance saying you can or cannot have chickens. In fact Old Man Sanders had chickens for a long time until he passed. I wonder where his chickens went? He sold egg’s for $2 dozen and they were the best egg’s I have ever tasted. I hope you are going to sell eggs cuz I will be one of your best customers. How many chickens are you going to get? What about a rooster that will sit up top of your house. You have the perfect yard for them. I am so excited for the chickens to come to town. If you want help or just a chicken baby sitter I would love to watch them when you are gone. That sounded funny a chicken baby sitter. See you on Friday at the Pot luck I heard you were cooking. Thanks Laura for checking the city ordinance and running it by Earl. I have wanted a coop for a long time but was traveling all the time and it’s hand to travel with chickens. Thanks for much for the offer of watching the chickens when I have to go out of town I will take you up on it. I plan on driving to pick up chicks next week if you want to ride along. I am going to start out with 6 and see how it goes and how many egg’s I get. 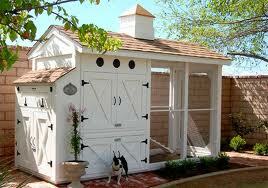 The coop is being delivered and set up on Saturday here is a photo of the one I chose. Yes I am cooking on Friday I am bring a chicken dish I love here is the recipe for a sneak peek. Next time I cook for the Pot Luck I will make something with fresh egg’s like a pasta dish. Halve chicken breasts horizontally, keeping 1 long side attached; open halves like a book. Pound breasts until 1/4-inch thick. Season on all sides with salt and pepper. Place 1 chicken breast on a work surface, cut side up. Overlap 2 slices prosciutto on top of chicken, leaving a 1/2-inch border. Top prosciutto with 2 slices provolone; layer 8 basil leaves over cheese, maintaining 1/2-inch border. 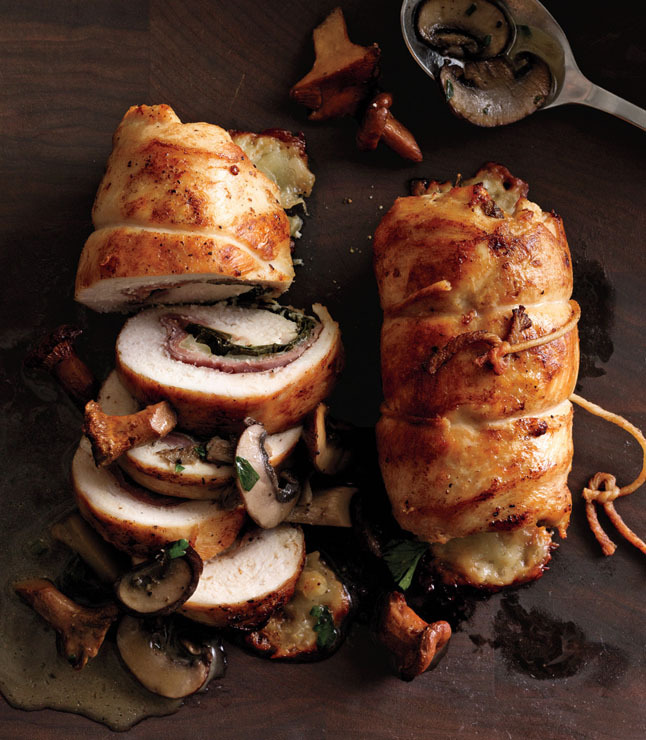 Roll up chicken lengthwise and tie with kitchen twine. Repeat with remaining chicken breasts. Preheat oven to 450°. Heat 1 tablespoon butter and oil in a large heavy ovenproof skillet. Add roulades and cook until browned on all sides, 8-10 minutes. Transfer skillet to oven and bake until an instant-read thermometer inserted into center of roulades registers 165°, 7-8 minutes. (The chicken will be cooked through but still juicy.) Transfer chicken to plates and let rest for 10 minutes. Scrape drippings and any melted cheese from skillet; discard. Set skillet over medium-high heat and melt 1 tablespoon butter. Add mushrooms. Cook, turning once, until mushrooms are golden brown, about 5 minutes. Season with salt and pepper; add broth and vinegar. Simmer until liquid is thickened and reduced, 10-12 minutes. Stir in remaining 1 tablespoon butter and herbs; season with salt and pepper. I am doubling the sauce and serve with rice. Category: Chicken, Church Cooks, Krissy Carpenter | Comments Off on The Chickens Are Coming to Churchville Oh My!